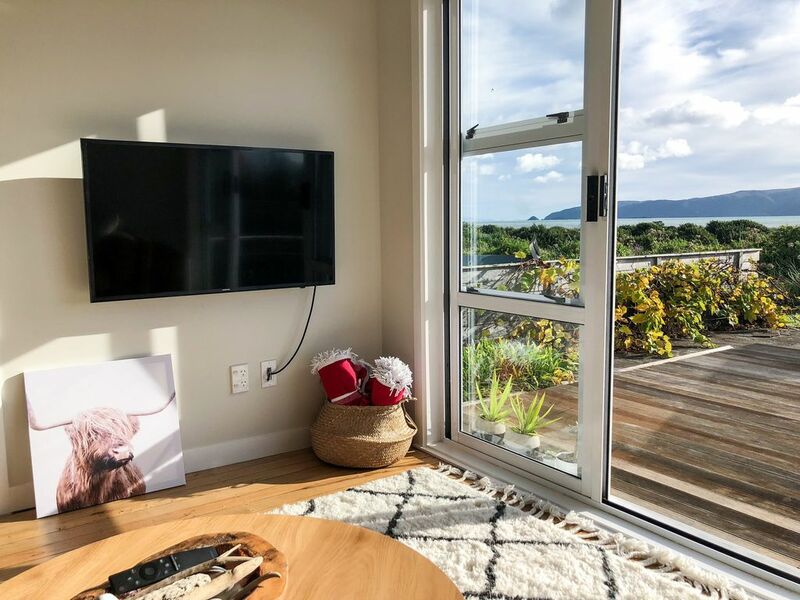 This newly renovated apartment has 180 degree views of Kapiti Island and is directly on the sand. It is one of the few properties in Paraparaumu Beach that is absolute beachfront. This property has polished floorboards, stainless steel Bosch Appliances, Smart TV, Free Wifi, new Freedom furniture, new Nespresso coffee machine with pods included and is only a 10 minute walk into Paraparaumu main street. This is the only newly renovated property on the beach side in Paraparaumu that has 180 degree views of the beach and Kapiti Island. This property has just had a large new deck built and is in a great location if you love the outdoors. *Snapper, Kawaii and Gurnard fishing right at your doorstep. *Linen and towels provided. Cleaning extra. Both required. Recently renovated with brand new Freedom furniture and is right on the beach. Single use Aromatherapy and Co. products provided. Tea, Coffee, Sugar, Milk, Olive oil, salt, pepper, bottle of wine. A wonderful stay in a very comfortable apartment. Everything was great....lovely decor, very comfortable bed, fabulous views of Kapiti Island, proximity to the beach and conveniently located to local amenities. Looks can be deceiving. As you arrive you’ll feel a little catfished however all is not lost once you open the door, Modern, sleek and stylish with a breathtaking view. The beach is a very short walk straight off the deck and you can follow the beach right into Paraparaumu Beach township. There were toys to entertain the little one and wifi to keep you in touch with the world. We loved our stay and hopefully will stay again in the future. Had a lovely and quiet couple of days away. Beautiful veiws even if weather not so good. Very comfortable with a very well appointed makeover. We will be back! Deceptively stunning little retreat with tracks directly to the sea. An immaculate modern apartment with an exterior which belies the standard of the property. The equipment is virtually brand new, the dishwasher, the washer/drier, the microwave, the nepresso machine(with pods), the smart tv and to top it all, the beds are superb. From the lounge you can watch the sun set over Kapiti and hear the waves crashing in. It was our last stay before coming back home to the UK and it enabled us to leave with a beautiful image to carry back to the cold and wet of Northern England. Than you Hannah and James, we wish you well with this lovely little spot. Beautifully presented. V v v comfortable. Could have stayed longer. Beach access was outstanding. We had a divine stay. Slept excellently and woke to outstanding views and beach sounds. Wine, coffee pods and showering condiments were all a lovely touch. Thank you for sharing your slice of paradise.